Recognized as one of the area’s most fun charitable events, the 2010 Capital Area Food Bank’s 7th Annual Blue Jeans Ball at the Marriott Wardman Park is all about comfort and a good cause. A chance to sample some of the area’s finest cuisine, enjoy live entertainment, and bid on live and silent auction items. The Blue Jeans Ball is a one-of-a-kind, community-wide charitable event that encourages residents in the DC area to “come as you are,” learn more about the high prevalence of hunger among our neighbors throughout the metro region, and become part of the solution. 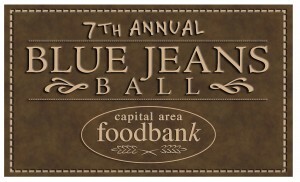 This year we added a new and exciting element to the Blue Jeans Ball. Pastry chefs from around the metro area will be creating “food” themed cakes as the featured desserts for the evening. Renowned chefs such as Michel Richard of Citronelle and Central, will participate in the creation of specialty cakes for the evening. To purchase a ticket, visit www.CapitalAreaFoodBank.org or call Jana Richardson at (202) 526-5344 ext. 234.